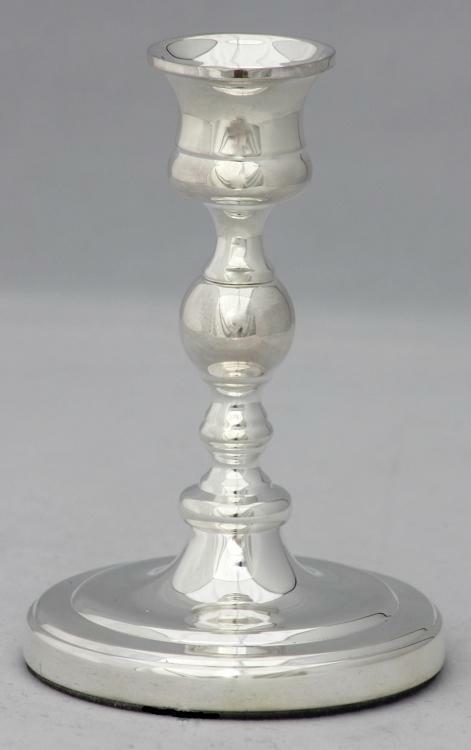 Our medium Concord Colonial Candlestick measures 4-3/4" high X 3-1/4" base. The Silver is treated with an anti-tarnish finish to keep it shining, the base is felted to protect fine finishes. This candlestick weighs 12 ounces.Candle Follower sold separately. The Concord Colonial candlestick is shown with our #BS1010 Hammered Vase which may be ordered by going to our Tabletop page or by clicking here on Tabletop Items. 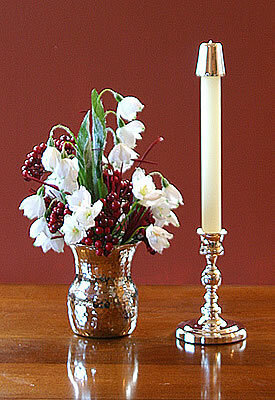 These sweet silver candlesticks look perfect on my small round dining room table which is set with a Valentine''s theme. Received many compliments from my Valentine lunch guests. As with all of our silver or nickel candlesticks, the Concord candle holder is cast of the finest solid brass, which is then finished with a heavy silver plate. This series is also available in our Polished Brass and Pewter finishes.